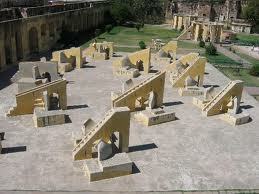 Jantar Mantar is Ancient Math and Astronomy Site in India. Jantar Mantar is an excellent place to visit in India! It's located in the city of Jaipur, India, in the state of Rajasthan. It is a collection of architectural, astronomical instruments that were built by Maharaja (King) Jai Singh II between 1727 and 1734, during India's medieval history. The one in Jaipur is modeled after the original built for him at the Mughal capital of Dehli. There are five of these collections in total that were created, but Jantar Mantar is the most well preserved of the five. The name translates into "instrument formula", or a clearer interpretation would be "instrument of calculation". It's easy for outsiders to misjudge India. Some people, who have never been to India, think that the people here are only now beginning to understand complex concepts such as the declination of planets or the mathematical tracking of stars. Some people think India is just now learning to determine celestial altitudes of planets. These perceptions are very false. In fact, India led the way in discovery on these topics and more! People need to learn more about India's culture and its history, so that they have a more educated understanding of this country. When I visited this fantastic site, I understood immediately that India understood these complex ideas and formulas long ago. When you visit this historical site, it's easy to see that India truly understood complex math and astronomy concepts. They were able to place them in an educational observatory area that anyone could learn from and enjoy. The observatory has fourteen major geometric devices for measuring time, predicting eclipses, tracking the star's locations around the sun, determining the declinations of our planets and more. Each exhibit is set in stone and has a specific purpose. The Samrat Yanta, known as the worlds largest sun-dial, whih is a device for telling the time by measuring the shadow of a vertical beam. 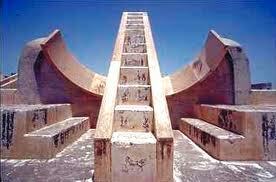 This sun-dial is 90 feet high, and its face is 27 degrees, which happens to be the latitude of Jaipur. The arrival of heavy monsoons and eclipses alike were announced from the tip of this instrument. A man would stand at the top of the ledge and make these announcements. They are still made today! All instruments are built from stone and marble and have restored bronze plating to describe each items function. 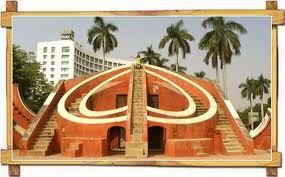 In 1947, Jantar Mantar was declared a national monument of India. Although this is a popular tourist attraction, many scientist actively use the facility today to conduct research and to educate others. This is one of the top places to visit on our India destinations list. It's located in Jaipur, which has a lot of other great destinations to check out as well! Leave Jantar Mantar to discover more top India Tourism Destinations. Go to our homepage to discover more of India.